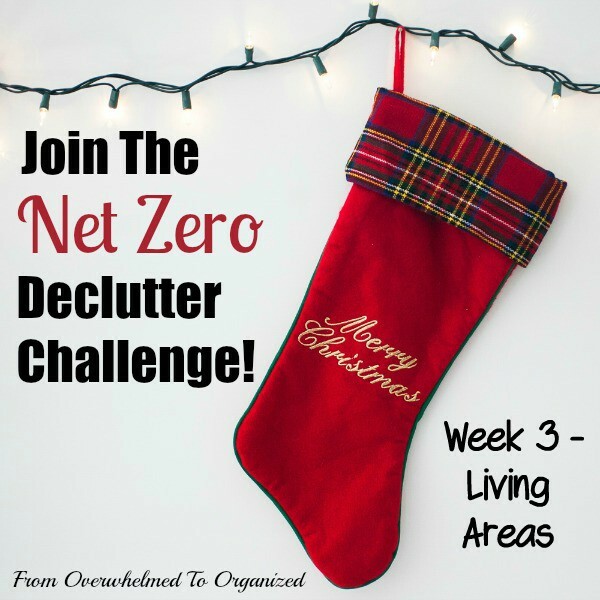 It's living areas week in the Net Zero Clutter challenge! Are you ready to declutter rooms like your living room, family room, dining room, and entry / hallway? This will make it much easier to tidy up and clean your home before entertaining for the holidays! And your friends and family will have space to enjoy themselves in your home. If you're having guests stay with you, this is a great week to declutter your guest room too. 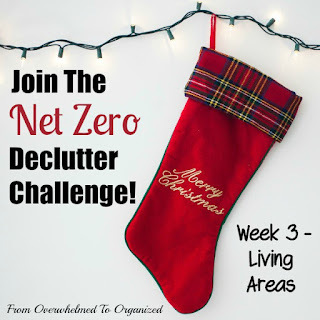 If you feel overwhelmed during the month of December with all the stuff that enters your home, join the Net Zero Clutter challenge so you can enjoy this festive time of year! Our living areas tend to become cluttered quickly and easily, even if we're pretty diligent about tidying up regularly. Because these are the rooms we spend most of our time in, it's easy to dump things and not pick them up. Once there are a few items on a table or surface, it's easy to just add a few more and then a few more and before you know it... you've got a cluttered room. One of the good things about clutter in living areas is that often it's actually items that belong somewhere else in our homes. So it's not "clutter" in the true definition of the word (things we don't need, use, love, or have the space to store). It's more like piles of stuff we were too lazy to bother putting away before. Or that other family members didn't put away. Or even items that don't really have a "home". But, in the midst of those kinds of items, there is also likely some actual clutter. Items we actually don't use, or need, or love. And our living areas are not intended to be storage areas, so if the items have landed there, we likely don't have the space to store them elsewhere. Those are the kinds of items I want you to focus on this week. We want items to leave our homes as part of the #NetZeroClutter challenge! Relocate items that you still need, use, and love (I recommend putting them in a pile or box or basket as you go through each room and then put them all away at the end, rather than putting each individual item away as you come cross it - you'll stay focused and finish quicker this way). Throw away any garbage or recycling that has accumulated in your living areas (likely lots of unnecessary paperwork and food wrappers). Declutter any coats, jackets, shoes, or boots that don't fit or that haven't been worn in over a year (and put off-season outerwear somewhere else in your home (spare room closet, wardrobe in the basement, storage bins, etc.) so there's plenty of room for your guests' items when they visit. Add a basket on or under coffee tables or end tables for small items like remotes, charging cords, pens, notepads, coasters, etc. so your surfaces look nice and can remain uncluttered. Add a basket or tray near the entry for small items like keys, glasses, wallets, spare change, etc. so they don't make the entry area appear cluttered when guests arrive. Once you declutter your living areas, spend 10-15 minutes each evening with everyone in the family working together to put items where they belong. We still have some everyday decor that we haven't put out or hung up yet and it's currently stored in our guest room. But with our Christmas decor out right now, we've put a hold on the everyday decor. I'm sure some of it will be given away because our new layout is different than in our old home and I don't want our home cluttered. But that will be a project for January. Not as much as I'd hoped, but it's really a lot more difficult to find items to declutter since we decluttered so much this summer and early fall. I'm also working hard at not letting items enter our home that I know we don't need or won't use. Take some time this week to declutter your living areas. Or anything you'd like to declutter! Take some pictures and share your progress on social media using the hashtag #NetZeroClutter. Let me know how you're doing in the challenge so I can cheer you on! 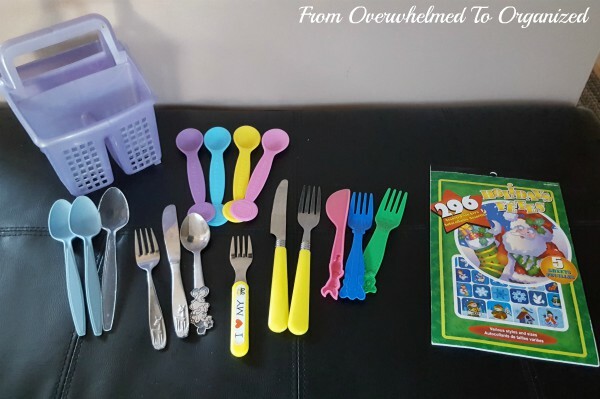 So that's this week's post in the Net Zero Decluttering Challenge! I'm enjoying doing this challenge and I'm excited to have you join me. I love hearing all the stories of how much more you're enjoying your holidays because you're not overwhelmed by all the stuff in your home! How much did you declutter from your living areas this week? How about your kitchen items last week? How are your overall in / out numbers? How are you preparing for all the new items that will enter your home next week? Living areas tend to get cluttered because this is where we bring (and dump) all of our stuff. I think I have some DVDs I could get rid of - maybe I'll do that today! It's true Seana... we LIVE in our living areas so they just naturally get cluttered. Happy DVD decluttering!